Ten minutes of gentle weekly exercise such as pottering around the garden in middle age lowers the risk of an early death, researchers have found. Health officials have long advised people that the more exercise they do, the better for their health. But experts are increasingly concerned that many people are put off by daunting guidelines that say everyone should do at least 150 minutes of physical activity a week. Some 39 per cent of adults in the UK do not take this advice. The new findings demonstrate as little as 10 minutes of moderate exercise a week is significantly better than nothing. The study, for which 88,000 Americans aged 40 to 85 were tracked for an average of nine years, found that those who did between 10 and 60 minutes of activity a week – such as walking, gardening or dancing – were 18 per cent less likely to die the study period than those who did no exercise at all. The authors, writing in the British Journal of Sports Medicine, stressed that doing more exercise sees the health benefits increase further – and those who hit the 150 minute guideline were 31 per cent less likely to die than those who were completely sedentary. Those who clocked up ten times this amount – 1,500 minutes or 25 hours a week – had a 46 per cent lower risk of death. But they said for many people it is an achievement simply to get off the sofa and do a little exercise. The researchers, from the University of Texas in the US and Shandong University in China, suggested health authorities around the world should reconsider their minimum exercise threshold. A GP surgery began prescribing allotments to patients with stress and mobility issues, it was reported last month. The May Lane Surgery, in Dursley, Gloucester, started offering gardening spaces to people with social isolation or joint pain to get them fitter – and onto a healthy diet. Doctors at the practice said they had previously recommended exercise or the gym, but allotments come with the added benefit of an improved diet full of fruit and veg. Dr Simon Opher, of the surgery in Dursley, Gloucester, said medical experts ‘sometimes medicalise problems which have a different solution’. He added the allotments are to to be used alongside traditional treatments such as medicine which remain effective. ‘We found that beneficial association between leisure time physical activity and mortality starts from a low dose,’ they wrote. Public Health England is increasingly worried about the millions of inactive middle-aged people who continuously put their busy lives ahead of the needs of their health. They have repeatedly warned that Britain is the midst of an ‘inactivity epidemic’ – with cancer, diabetes and heart disease awaiting many of those who do no exercise at all. A report by the King’s Fund health think tank in 2016 called on the NHS to set up more gardening schemes, urging doctors to ‘take advantage’ of Britain’s ‘love affair with gardening’. 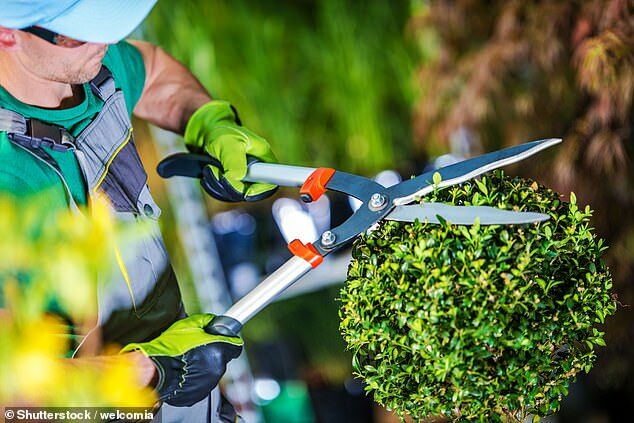 The Royal Horticultural Society calculates that half an hour of digging burns 150 calories, the same period raking a lawn burns 120 and pushing a lawn mower for 30 minutes burns 165. While running may use up slightly more calories – about 240 for a half an hour jog – doctors think elderly people are more likely to take up gardening than more vigorous exercise.